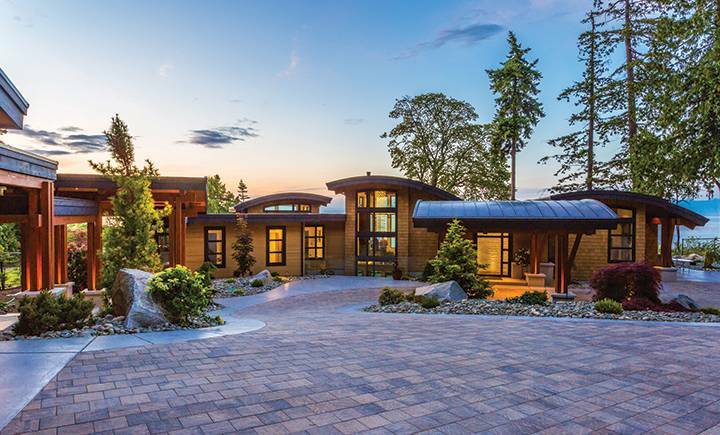 “I wanted to design a home that had an organic feel and flow in terms of its relationship to the land,” says custom home designer Keith Baker. Indeed Cadence, a series of low-lying interconnected spaces connected by pavilions, appears to nestle into the landscape, angled to take advantage of the light and the views. Influenced by the shapes of waves and the play of light, this luxurious seaside beauty embraces an organic asymmetry and a nature-imbued palette that inspires relaxed living. Located between forest and sea, with award-winning architecture that echoes the shapes of waves, Cadence is a home that invites serenity and relaxation without sacrificing luxury. That relaxing vibe is not just because of Cadence’s idyllic mid-Island locale. 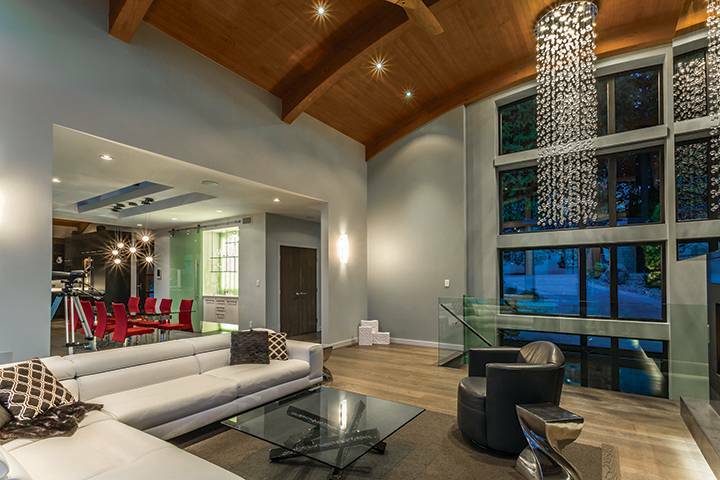 In fact, it has a great deal to do with the nature-inspired interior design and the skillful use of asymmetry and human-scale design by custom home designer Keith Baker of KB Designs. 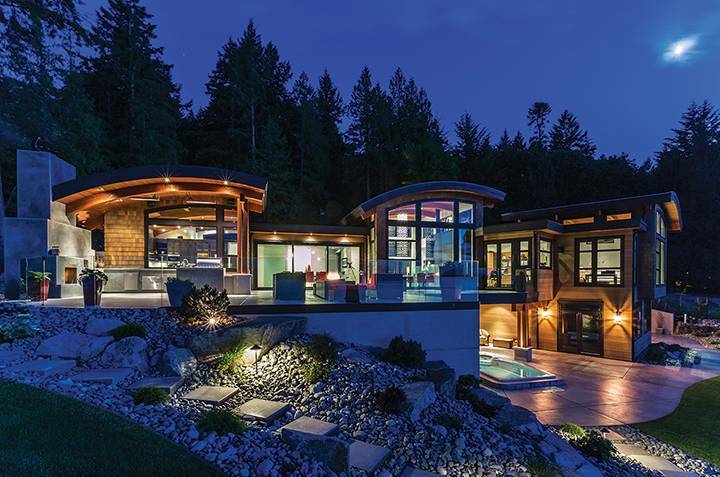 At Cadence, asymmetry is most evident in the radiused curves of the roofs, whose shapes bring to mind gentle waves. The play of light was also a big influence on Baker’s design. 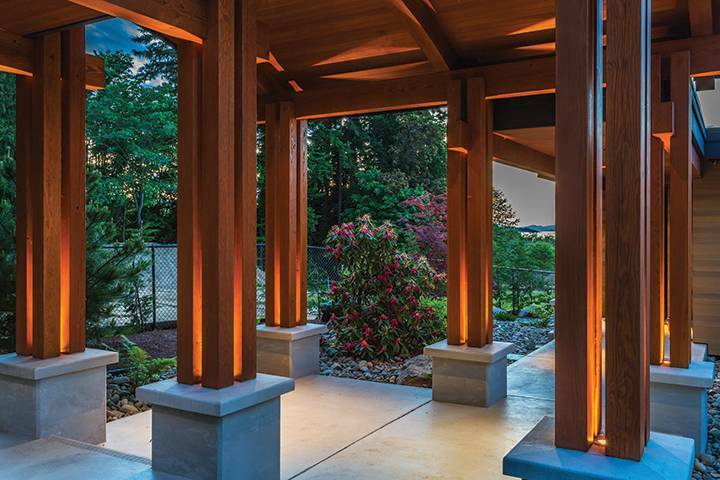 “I wanted the home to be light-filled and welcoming.” Cadence incorporates over 1,500 sq. ft. of windows into this 5,000 sq. ft. home. Cadence was a Silver Finalist in multiple categories in the 2014 CARE Awards, won three Silver Georgie Awards and is competing for Georgie Gold Awards in those categories, along with a national SAM Award. The main entry features a pivot door offering a clear view of the feature wall created from Modular Art’s InterlockingRock® panels in a Burle pattern with a high-gloss white finish. The breezeway from the garage and boat storage to the mudroom is a study in West Coast elegance and warmth, with clustered beams of Douglas fir. 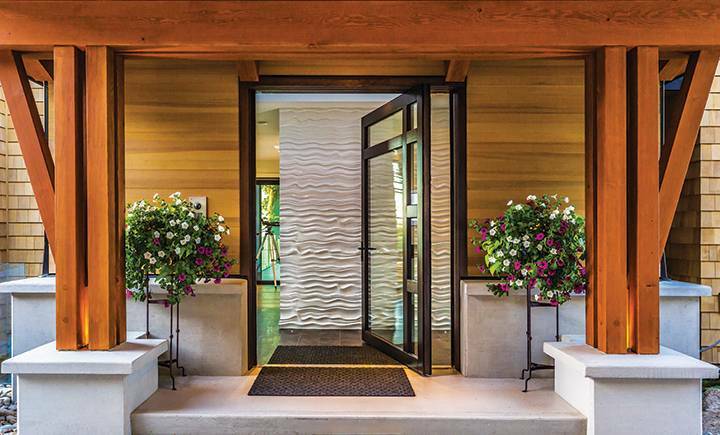 The home’s welcoming entrance features a graceful porte-cochère that provides cover from the elements. 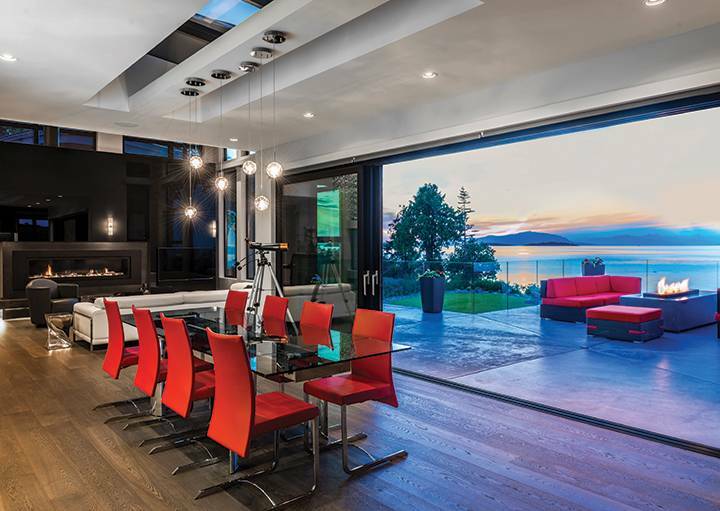 An 18-foot-wide, three-panel sliding glass door opens to a terrace with views of Georgia Strait. So as not to compete with the views, a nature-inspired interior palette was used, with only strategic pops of red in the leather Roche Bobois dining chairs. A Crystal Ball chandelier from Kuzco Lighting features strands of orbs suspended from a chrome canopy. A Roche Bobois Elixir cream modular sofa frames an inlaid wool carpet and a glass table that echoes the smoked glass feature wall, which in turn reflects the sky, sea and trees. In the kitchen, the Stone Age quartz countertop in Cascade White does double-duty as a window-sill, creating a seamless transition that appears to invite the outdoors in. Flat-panel cabinets in a grey/black stain feature sleek elongated pulls. 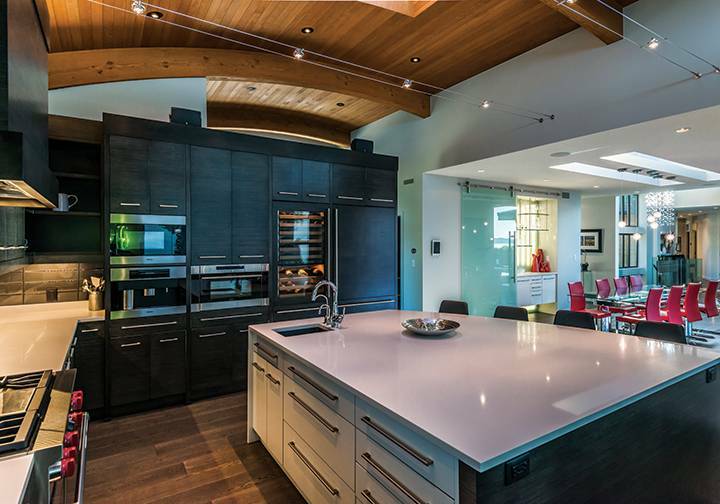 The kitchen is a chef’s dream, with Miele and Wolf appliances. Track lighting from Tech on either side of the skylight’s centre beam brings a contrasting industrial touch. 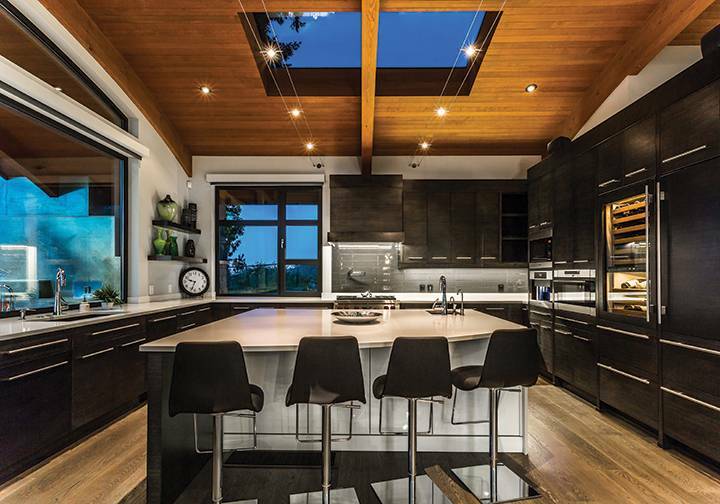 An outdoor kitchen on an entertainment-sized terrace features a wood-burning fireplace, pizza oven and wood storage. The concrete structure is set in relief, which appears to diminish its size so the view becomes dominant. 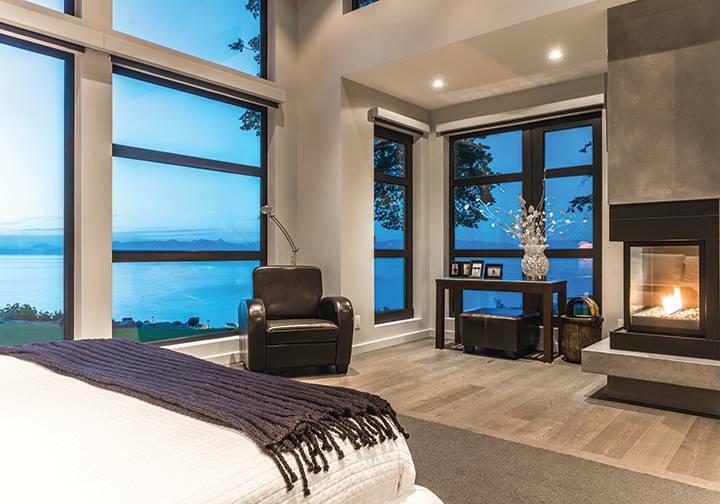 The master bedroom’s massive windows take full advantage of the sea views. 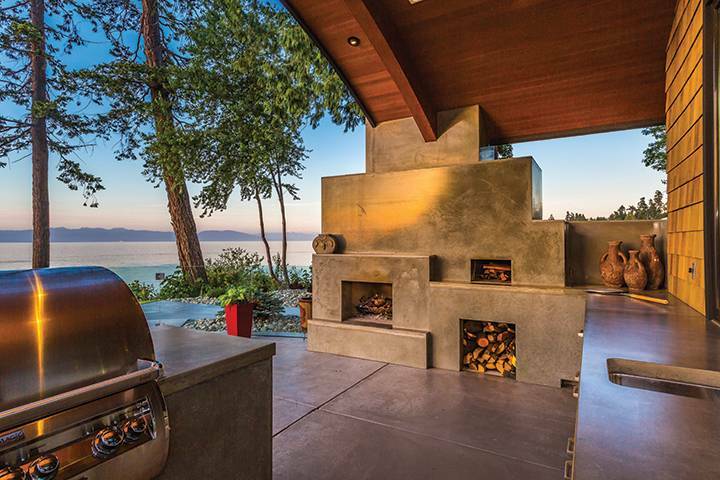 The sleek concrete of the gas fireplace echoes the finish of the fireplace that forms the focal point of the terrace. Despite the large windows, the bathroom is completely private. 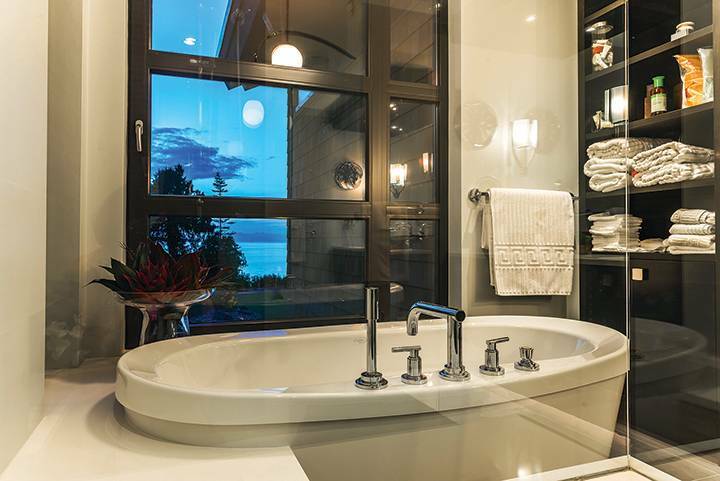 A sculpted soaker tub and open shelving lend a spa-like feel to the room. 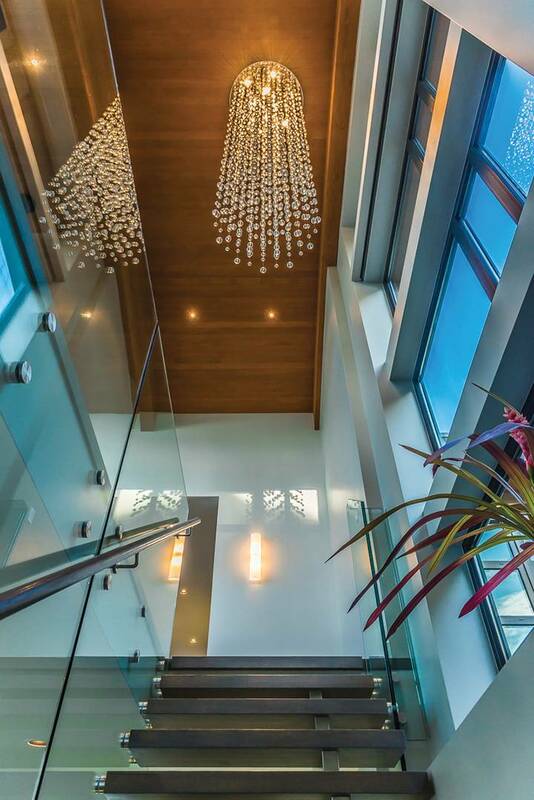 Beneath the Crystal Ball chandelier, a staircase bordered by windows and a wall of tempered glass — nothing to block the light — leads to the fitness centre in the home’s full-height basement.